Welcome to the July edition of the Simply Living Blog Carnival - Celebrations cohosted by Mandy at Living Peacefully with Children, Laura at Authentic Parenting, Jennifer at True Confessions of a Real Mommy, and Joella at Fine and Fair. This month, we write about keeping things simple with our kids. Please check out the links to posts by our other participants at the end of this post. It was nearly midnight. I should have been wrapping long ago, but instead I chose to fritter away my time on the Internet, roaming the endless wastelands of Facebook and parenting forums. 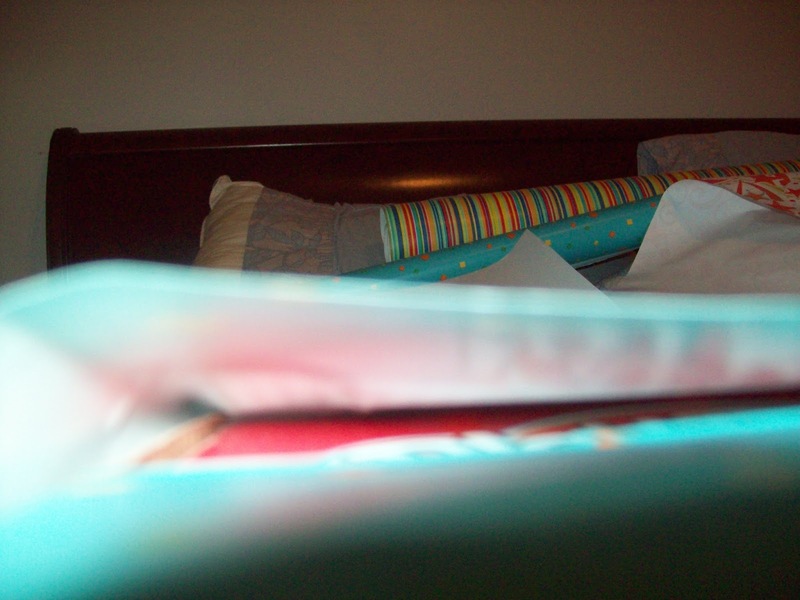 In my bedroom, a pile of wrapping paper, tissue paper, boxes, bags, tape and scissors awaited me. And every time, it goes like this: I give myself a little pep talk. "You're going to do it so well, this time," I say. 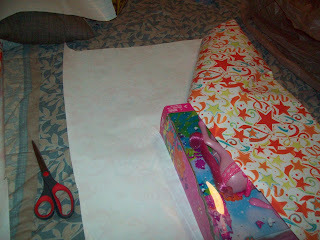 "You're going to take your time, cut straight lines, fold with care and precision, and tape gently, like the delicate wrapping guru you are." And I go in, and I start. And within my first three closures of those scissors, my wrapping paper begins to look like a five year olds rendition of a lightning bolt. And I give up. I just can't. I mean, who can with this? Okay, I don't really give up, and I don't make it easy on myself either. I mean, those hula-hoops weren't going to wrap themselves. 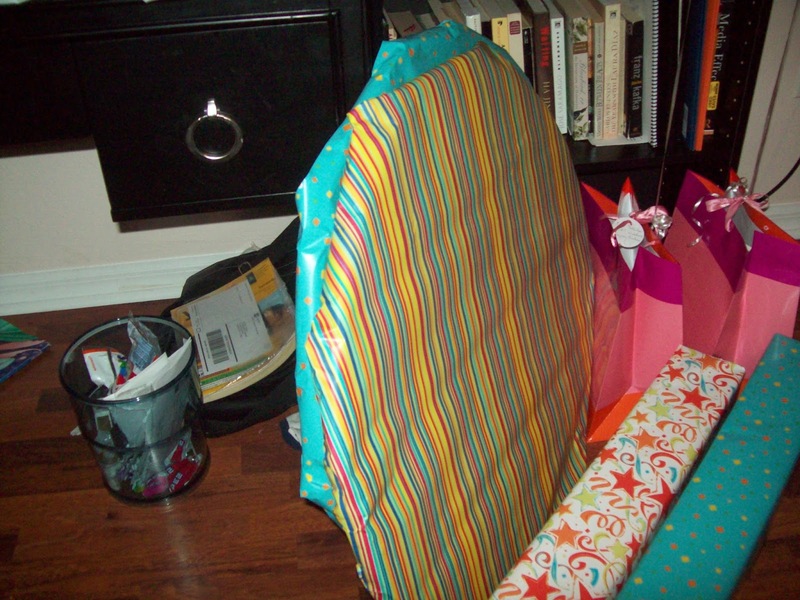 Have you ever tried to wrap a hula-hoop, by the way? Okay, so after a rousing round with the hoops, I choose something square. Easy, I think. Piece of cake. 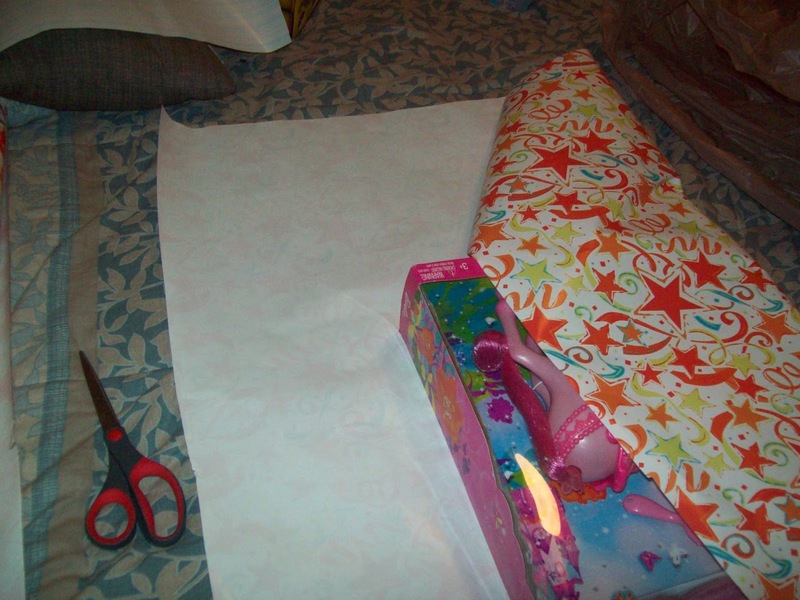 But I don't want to use too much wrapping paper. 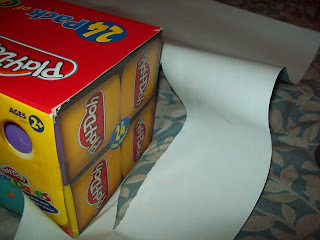 Turns out the "value pack" at K-Mart actually means three rolls of wrapping paper with a foot of paper each. Definitely not hula-worthy. But, alas, what always happens when you try to scrimp on paper? You're sure you measured it perfectly. So, you flip it. Try it the other way. You try the old 'diagonal trashy' look. Still not enough. Just put that crack on the bottom, and move on. Your kids aren't even going to see it, I promise. Well, you know better for the next time, don't you. 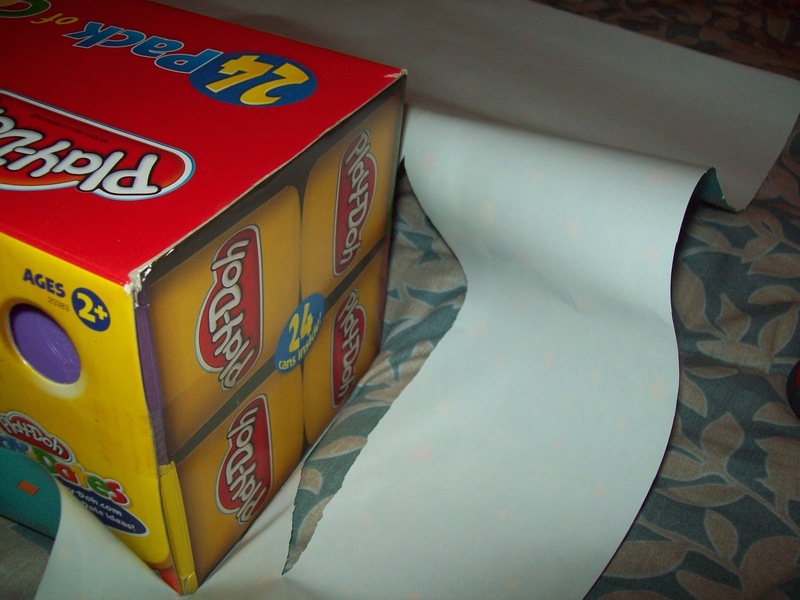 You definitely won't use too little wrapping paper. Of course not. You'll use too much. Hello, cursed wrapping bump. Oh how I've missed you since Christmas. 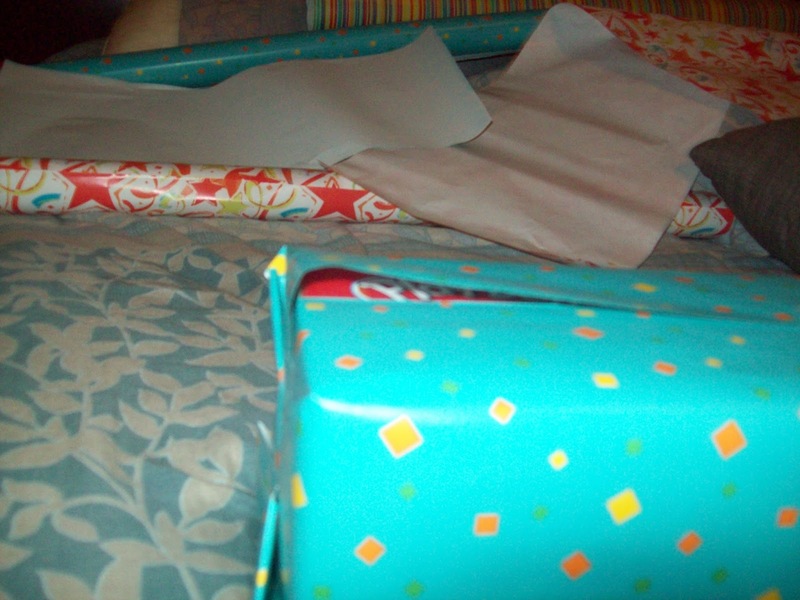 Here's another pro-tip about wrapping: Don't do it on a bed. 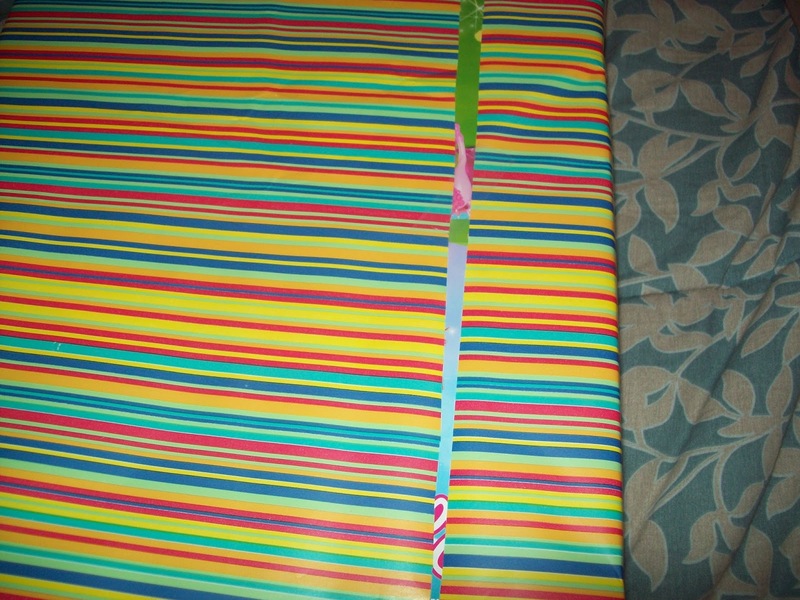 And if you do do it on a bed, for goodness sake, do not try to pull the present to a better position by the wrapping paper. Especially if it's Play-Doh and it weighs 40 pounds. 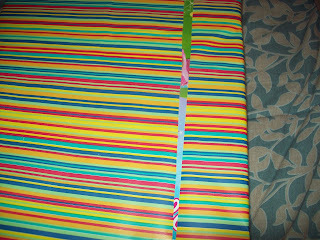 Seriously, I was gentle as hell with this wrapping (after ripping it, of course), and I still got the bump. How much tape must one use, wrapping gods? How much? This is Simply Living. Get with the program, yo. At least I got to steal pinata candy, right? Do you know what this is? 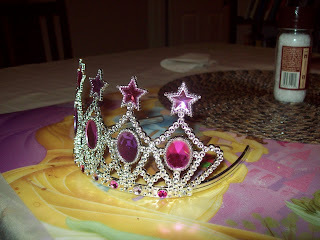 I called it "morning birthday crowns" and my daughters loved the idea. You know what it really is? 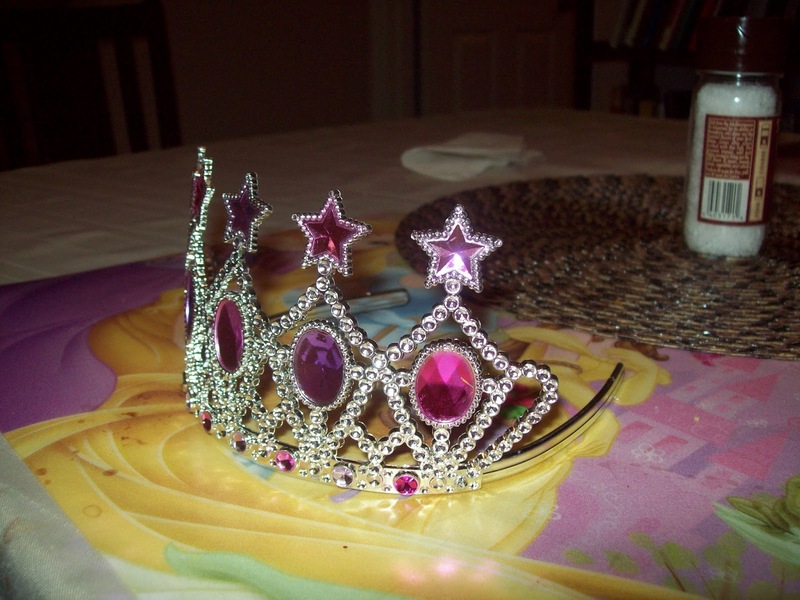 This is "there's no effing way I'm wrapping a crown that cost me a dollar. No. Effing. Way." Happy breakfast, princesses. This is another one of my favorites. I call this one "Yeah, that present is way to freaking big for that bag. I'm not wrapping any more. Bite me." 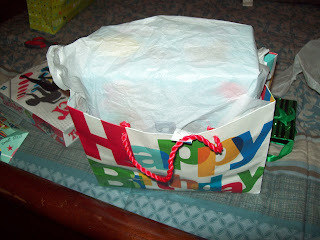 Also, I actually did run out of paper, and yes, I only had one sheet of tissue paper. They call me Miss Prepared. Well, actually, now that you mention it, at 2 a.m. that morning, it kind of did. That's not so bad for a few hours of stress, strife and fail! Take heart, fellow fail wrappers. Your kids don't really care what it looks like, so long as they can tear the wrapping off at some point. Thank you for visiting the Simply Living Blog Carnival cohosted by Mandy at Living Peacefully with Children, Laura at Authentic Parenting, Jennifer at True Confessions of a Real Mommy, and Joella at Fine and Fair. Read about how others are incorporating simple living and parenthood. We hope you will join us next month when we discuss Money Matters! 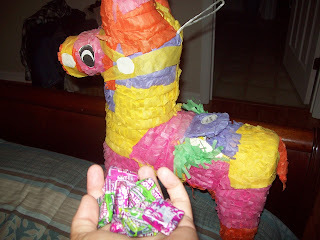 Parties - sustainablemum explains how and why she keeps her birthday celebrations for her eldest a simple affair at his behest. 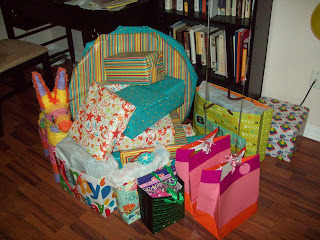 Simple Birthday Celebrations - Birthdays are kept simple at Living Peacefully with Children. Mandy shares how her family celebrates birthdays without the stress and expense. Countdown to a Simple Christmas - Start now to prepare your house and home for the holidays. Steps to take each month to enjoy a much simpler approach to Christmas. Simply Celebrate - Jorje has tried celebrating kid birthdays BIG and small... which one do you think was more simple? less stressful? 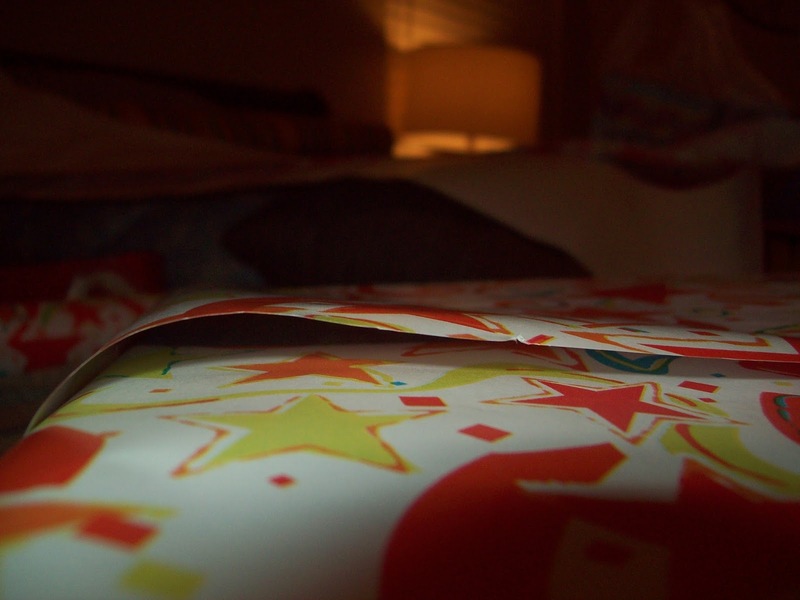 That's a Wrap - At Parentwin, Darlena describes her experiences with wrapping gifts and how she has changed her ideals when it comes to gift giving. Simple Celebrations - Laura at Authentic parenting shares how her family keeps celebrations simple. This post made me laugh, why do we always leave it so late? I have found myself using scraps of material and pieces of ribbon this year which, after the present has been opened, I discretely place back in my bag to use again!